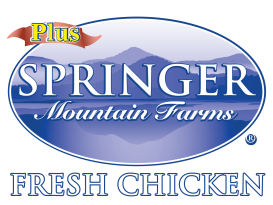 Baldwin, Ga. (Jan. 15, 2019) - Springer Mountain Farms is proud to introduce its new PLUS line of chicken products that will carry the Non-GMO Project Verified seal. The Non-GMO Project Verified seal gives shoppers the assurance that a product has completed a comprehensive third-party verification for compliance with the Non-GMO Project Standard. “Consumer awareness of GMOs has seen overwhelming growth and resulted in an increased demand for cleaner, more transparent food sources, like non-GMO foods,” said Gus Arrendale, President of Springer Mountain Farms. “That’s why we have worked to develop the Springer Mountain Farms PLUS line of products… all the same great attributes of our original PURE Springer Mountain Farms product line PLUS feed that is made from coveted 100% American-grown, Non-GMO Project Verified ingredients,” Arrendale added. Springer Mountain Farms PLUS chickens are raised on family farms with no antibiotics, hormones, steroids, or animal by-products ever and are certified by the American Humane Association. They are fed a high quality diet of 100% American-grown, pesticide-free, Non-GMO Project Verified ingredients. Consumers will be able to identify Springer Mountain Farms PLUS products by the new packaging that carries the well-recognized Non-GMO Project Verified seal - look for the butterfly. The new packaging eliminates the foam tray for most items, and replaces it with a new clear tray that is BPA-free and 100% recyclable. More products will be added as the line is expanded. Products are now being shipped to select supermarkets throughout the US and Puerto Rico and will be available in the fresh meat case this week. For information on where to buy, visit SpringerMTN.com and click “Find Us”. To learn more about the Non-GMO Project, visit livingnongmo.org. Springer Mountain Farms is a family owned poultry producer based in Baldwin, GA that strives to provide the healthiest and most delicious, highest quality chicken on the market. Springer Mountain Farms hatches, raises, and processes all chickens at farms and facilities located within a convenient 60-mile radius of the home office. Springer Mountain Farms was the first poultry company in the world to be certified by the American Humane Association for the humane treatment of chickens. Learn more about Springer Mountain Farms at SpringerMTN.com or connect on social media @SMFchicken.